I’ve got a little secret I need to get off my chest. I’m in love… with Peanut Butter! 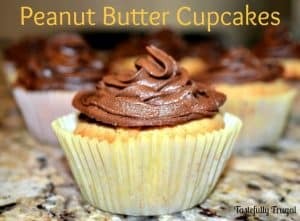 Ok, so it’s not really a secret; almost every snack I make has peanut butter in it! And today I want to share with you the recipe that started that obsession. These peanut butter cupcakes are so moist and are super filling. And the chocolate frosting is just the icing on the cake; or cupcake 😉 I wasn’t the only one who loved them. ; my boys did too! So much so that I really only got one decent picture to share with you today. Guess that means I’ll have to make more so I can take better pictures right?! After I run to Costco to pick up more brown sugar, and a million other things, I will post more pictures. Maybe I should bake them during nap time; then the only one I have to fight eating them is myself! While you’re waiting for better pictures, don’t just take my word for it, try these bad boys for yourself! Recipe adapted from Roxana’s Home Baking. Using a hand mixer, or a stand mixer, cream together butter and peanut butter until smooth and completely combined. Add brown sugar and beat on low speed until fluffy. It took me 3 or 4 minutes. Alternate between adding the flour mixture (about 1/2 cup at a time) with the milk (about 1 Tbsp at a time) until all combined. Fill lined cupcake pan about 1/2 full with batter. Bake for 20-25 minutes until toothpick comes out clean. I baked mine for 23 minutes. Let cool in tray for 5 minutes and then move to a cooling rack. While the cupcakes are baking you can make the frosting. With a hand mixer, or stand mixer, beat butter until fluffy. Again, it took me 3 or 4 minutes. Add the half & half and vanilla and mix until completely combined. Slowly add cocoa powder and then powdered sugar. Start with 2 cups of powdered sugar and then add 1/4 cup increments until you reach desired consistency. I used 2 3/4 cup. Once you reach your desired consistency beat on medium high (I did a #6 setting on my hand mixer) for about 3 minutes. Once cupcakes have cooled add frosting. Don’t forget to link your favorite recipes to our Tasty Tuesdays party! Hope you have a great day! Thank you for stopping by Robyn! Ah thanks so much Kendra! Yep they are on my list of treats to make… I have a feeling I’ll be baking 24/7 for the next few weeks 🙂 Hope you are having a great week!! Lou Lou Girls recently posted…It’s Time For A Wreath Giveaway! You are so sweet! Thank you for linking up and for hosting such a fun party too! Keeping my fingers crossed I win that adorable wreath! !